Early general election: What could it mean in Wales? 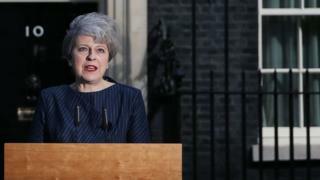 Theresa May has shocked the political world by calling a snap general election for 8 June. There are 40 MPs in Wales - presuming the prime minister's call for an election passes Westminster, what could the parties be facing as we head into the country's fifth poll since 2015? Don't we have an election coming already? There are elections for council seats in each of Wales' 22 authorities taking place on 4 May. There is no sign that these elections will be delayed to take place at the same time as the general election in June. What happened in the last general election? Labour remained the largest party with 25 seats, but the Conservatives had shock wins in Vale of Clwyd and Gower, the latter a constituency Labour had held for more than 100 years. With 11 seats, it was the Tories' best general election election result in Wales for 30 years. The Liberal Democrats had a dire night across the UK, losing 49 seats. Two of those were in Wales - Cardiff Central was lost to Labour and Brecon and Radnorshire to the Conservatives. Plaid Cymru held the same three seats from the 2010 general election. Which seats may change hands this time around? The Tories will hope they can attract voters from Labour and trigger more wins like they had in Gower in 2015. It will portray a vote for the opposition as a vote against stability while Brexit negotiations are under way. Could other constituencies that are Labour Tory marginals, like Delyn in north Wales or Bridgend in south Wales, go the same way? Labour tried to move the argument away from Brexit on Tuesday - with Jeremy Corbyn talking about housing, education and "the chance to vote for a government that will put the interests of the majority first". In Wales, Labour will try to make hay with its record in government in Cardiff. But efforts by First Minister Carwyn Jones to try to distance his Welsh Labour leadership from Jeremy Corbyn may be hampered when Mr Corbyn is representing the party day in, day out, during the campaign. The caveat in all of this is that the Conservatives failed to emulate their general election performance at the assembly poll last year - albeit in a pre-EU referendum political environment. Both of the seats won by the Conservatives from Labour last time around are razor-thin marginals, with just 27 votes in it in Gower, and 237 in Vale of Clwyd. The Liberal Democrats see the election as a chance to rebuild the party after its punishing 2010 election - and is brandishing its pro-EU anti-Brexit credentials in a bid to rally Remainers. Can it retake Cardiff Central and Brecon and Radnorshire? Meanwhile, Plaid Cymru has already attacked Labour for its division and will be hoping to similarly attract pro-EU voters. It is likely to have its eyes on Ynys Mon and Ceredigion - and could it emulate Leanne Wood's capture of the Rhondda assembly seat in Westminster? With the party in disarray and the defection of South Wales East AM Mark Reckless to the Tories, it may struggle to make a mark in a first-past-the-post election despite the success at returning seven UKIP AMs elected via the Assembly regional lists.